Exploring the Wasteland Waterway Cave in Ontario, Canada, originally uploaded by Mic2006. 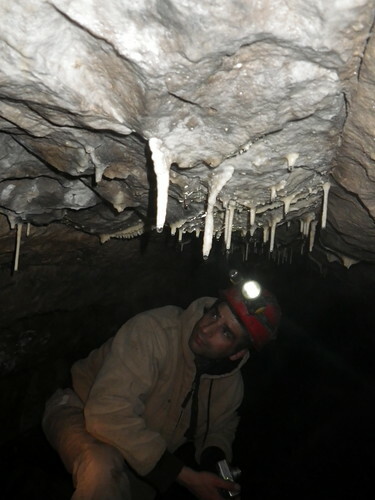 For cave exploring in Ontario this one is possibly one of the more exciting possibilities. This past weekend Jeff and I explored the tunnels for some short distance, but we were turned back by the conditions which were less than favourable – namely the cold, the prospect of a storm on the surface and my knee pads which kept sagging down and so my knees were torn to shreds. nevertheless, for Adventure in Ontario I am still optimistic of eventually reaching the end. Thus far several pushes have not revealed the sump-point. On one trip we reached a spot called the aero-foil and past that a squeeze then bigger tunnels beyond. I am thinking that the cave goes deep and the many sinkholes in the area must meet up with these tunnels somewhere beyond where we have crawled. 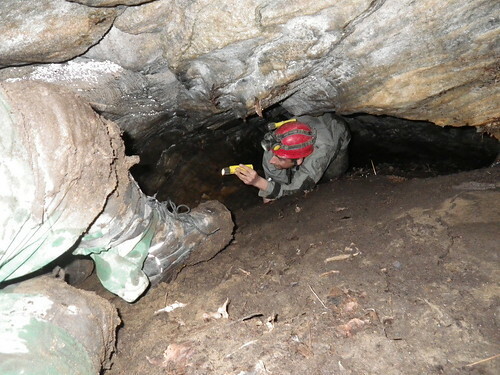 Winter Caving Hell – adventure Sport in Canada, originally uploaded by Mic2006. At the end of this tube the water and tunnel roof came to within about an inch of each other and there was a good breeze blowing through the gap. Unfortunately I finally lost my nerve as the tunnel along which we’d come was refilling with water, and underground water (midwinter or otherwise) can be a little numbing. My caving partner at the time had traced the resurgence of the water in this passage to a spot several hundred meters distant. When I finally emerged from the tube the front of my wet suit was pierced by innumerable rusty spines from the barbed wire that had once lain over the top of the feature, I suppose I must have looked like an industrial-age porcupine that had run into decline like the many factories of the region. Oddly, though my skin had also been punctured I had never felt a thing, but knowing they were there and pulling them out was a little creepy – I’m surprised I never got tetnus. This project took place around 10 years ago and it certainly presented a few challenges, amongst those obstacles the need for me to loose around 20 pounds to fit in the tube and make it back alive. Embryo Cave, originally uploaded by Mic2006. JC and I spent the weekend at one of our favorite northerly destinations exploring both Embryo and Twin Trickles caves. Both these caves are seldom visited and if it were not for the initial visit by Marcus and Brad they likely would be entirely forgotten by now. Both Embryo Cave and Twin Trickles are marble caves at the edge of the Canadian Shield (near Toronto Canada), but they are very different in character. Much as you might imagine, Embryo Cave is a cave that is smooth inside, easily traversed, the long borehole crawl being in soft silt, while Twin trickles is a cave in which you shred your knees, cave suit and anything else on or around you. The rock in Twin Trickles is sharp and jagged, the cave dips quickly downward through jagged portals and though the marble is beautifully banded there is more a feeling of intimidation in this cavity, it varies between tight and spacious, dry and soaking wet, jagged and more jagged, with lots and lots of black flies – see video on Embryo Cave here. Winter hiking near Toronto (Behind an Ontario Waterfall in the Winter), originally uploaded by Mic2006. 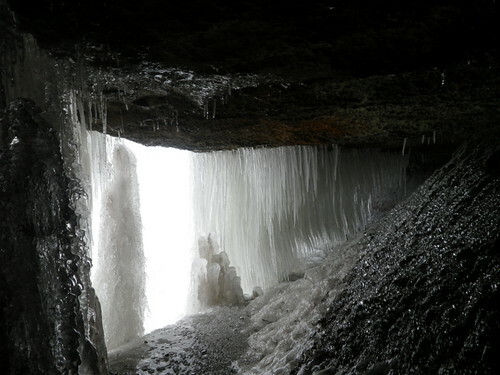 Some time ago I did some winter hiking near Toronto (Niagara Escarpment) and explored behind a waterfall to see how it would look with all the icicles. Needless to say it was amazing – exceeded my most hopeful expectations. Most impressive was this low rumbling sound that filled the whole cavity, it was a new dimension to my unusual Ontario based travels – sound. Check out this video of behind an Ontario waterfall – here. In line with the publication of my first book in 2005 (Rockwatching), in the video that I have linked to just above, I show a little bit of the local rock and the contact between the Queenston Shale and the Whirlpool Sandstone. Secret Tunnel to Dracula’s Garden, originally uploaded by Mic2006. Leaving from Jeff’s house in Guelph, the three of us braved the winter evening and followed a secret tunnel to a place that is known as Dracula’s Garden. The garden is really a secret room beneath a city in Ontario. The trip there and back was exhausting. We were underground for just over 2 hours, crawling, duck walking and stooping. We waded through an old and crumbling passage that is known as the blood sluice – and at the end, a most incredible place that is decorated in soda straws and various other formations that are usually found in caves. Jeff found a strange green marble that we called the “Dracula’s Eye” and SNAFU discovered a symbol part way along the hidden passage that was etched into the wall; I say it is for the Illuminati, but that is only wild speculation. Most intriguing about the speleothems in Dracula’s Garden is the fact that they have formed so incredibly quickly. 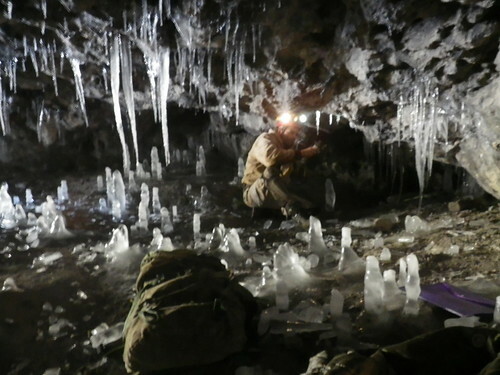 Soda straws, curtains and stalactites are composed of calcite that has been leached out of the soil and rock above and re-deposited within an underground cavity. The basic process is that carbonic acid dissolves the calcite as acid laced ground-water passes through calcium rich substrate. Cool temperatures, lots of water and the presence of organic matter adds to the concentration of the acid. By the time the carbonic acid rich water reaches an underground cavity, and is is heavily laden with dissolved calcite, it gases off carbon dioxide and becomes super-saturated with calcite, thus it dumps this at the edge of a speleothem and grows it as some fantastic lacy rock pinnacle or curtain or cave pearl. In Dracula’s Garden the speleothems have grown with amazing rapidity. Decorations like those seen here are usually thousands of years in the making, these formations are pure and white and hard and yet they could not be older than the cavity in which they’ve formed – about 100 – 160 years in age. Conditions for speleothem growth must be ideal. I had once seen a single soda straw in a sewer in Hamilton (Stairway to Paradise), but it was puffy and porous – more like tufa than the pure and well formed soda straws in this spot. Two hours of crawling and duck-walking leaves my legs in agony today. I can barely walk and I’m sure my companions are suffering some similar pain as well – SNAFU more his knees being a problem as being the tallest he found the height most dehabilitating and he crawled more than duck-walked. In the video you can hear this strange whump, whump sound in the background, that’s him crawling in his hip waders. As it is now dark I think a little hot tub therapy might ease the pain – standing after sitting is the worst and going down steps is almost impossible (I have to go down backwards on my hands and knees). Caves near Guelph, Canada, originally uploaded by Mic2006. Jeff and I believe that this small group of shelter-like caves near Guelph, Ontario, Canada might well be the resurging exits to a system that slopes downward from the river valley along the bedding plane. It appears that from the visit that we made, the tunnels all slope downward and are soon filled with clay and gravel. It appears that since our visit the previous weekend, the ice crawl into the #8 cave has got significantly tighter. The February thaw and then flash-freeze has almost closed some passages in places. I vaguely entertained the thought of the tunnel freezing shut behind me. That would be a nasty way to die, especially considering that lying on the ice, with my coat pulled up from my stomach I was getting a taste of how it would feel to be slowly freezing. Anyway, we did find a spot with blowing air on our previous visit and we also saw 2 likely spots where digging might open further passage. I am reminded of the dig and railway system that I had once seen in the Cheddar Cave. Eventually those cavers reached the river Axe and from there some incredible stories of underground and underwater exploration.